From diaper rash to eczema, from ringworm to chicken pox, there are many types of toddler rashes that turn a baby's soft skin red, blotchy and scaly. Toddler rashes are quite common and usually not a major concern. Most of them disappear on their own and are pretty harmless. However, if the redness and soreness persists, rushing your child to a medical practitioner is advisable. You may find that sometimes a prolonged illness, allergic reaction or even a cold can cause specific skin conditions in toddlers. From diaper rash to eczema, from ringworm to chicken pox, and from cold sores to cradle cap, there are many skin conditions that turn a baby’s soft skin red, blotchy and scaly. Rashes don’t usually need urgent medical intervention. However, knowing what they are can help you treat them faster. Here, we are going to take a look at some of the most common types of toddler rashes and how to treat them. But before we begin, let’s understand a rash. A rash is a change in the texture and colour of a small or large part of the skin. The skin may become scaly, red, sore and even bumpy with a rash. There are various terminologies that are used for rashes based on their appearance and intensity. These terms will help you identify the rash quickly. Raised: You will feel a bump when you run your finger over your toddler’s rash. Flat: As the name suggests, you will only see redness or a blotchy patch but it won’t be raised. Lacy: You will notice that the skin over the rash has a lacy design on top. Bumps: This means exactly what the name suggests, it is a raised bump. Pimply: This will be a raised rash with a tiny white head in the middle, just as you see in a pimple. Blisters: The bump in this case will be filled with a clear fluid. Spots: These are just like pigmentation and are red and flat. Pustule: This is a pus-filled raised bump. Blotches: These are red and skin-coloured patches and are usually flat. Welt: These are similar to blotches, but they are raised and can be red in colour. Patch: This is a small red or skin-coloured area on the skin and is sometimes the size of a pimple. Hives: A slightly bumpy red area on the skin that can be itchy. You will notice most medical practitioners using these common phrases to describe your child’s skin condition. Now let’s move on to see the different kinds of toddler rashes and how to deal with them. Yes, babies also get acne. This skin condition usually appears on their cheeks, forehead, chin and even on their backs. It can be present at the time of birth or appear in infants aged two to four weeks. Fortunately, it clears up at around three to four months. But there’s no exact cause for this. This skin condition first appears on the face, scalp, torso and back. Then it slowly spreads all over the body. You will notice small red bumps all over your toddler’s body if he has contracted chicken pox. These soon turn into blisters that are filled with a clear fluid. As the illness progresses, these blisters become itchy. After two weeks or so you will notice the blisters turning into dry scabs that eventually fall off the body as the child recovers. Usually young children get about 250 to 300 blisters in all. It is also possible for some to have just a few if they have just had a chicken pox injection. Remember that chicken pox is one of the many toddler rashes that is extremely contagious. If you’ve never had chicken pox yourself, chances are you might contract it from your toddler. If your baby doesn’t have fever, you can try giving them a bath after a few hours and keep them dry. Home remedies include sprinkling baking soda or colloidal oatmeal in his bath to calm the blisters. This skin condition is quite common in toddlers. It appears either on or near the lips. You will notice small pus-filled blisters that get bigger and eventually burst or even crust over. Remember that cold sores are contagious and caused by a virus. So if you notice them on your baby’s face do not to kiss him or touch the affected area. Also, make sure he doesn’t touch his eyes after touching his lips. That can cause a serious eye infection called ocular herpes. Cold sores are also quite painful, so avoid touching them. The best home remedy for cold sores is to apply ice on the affected area. You can also try giving your child a mild pain reliever like acetaminophen. If your child is six months or older, he may be prescribed ibuprofen by a doctor. You should also avoid giving citrus or acidic foods to your kid when he has a cold sore. Refer to a doctor if it doesn’t go away. This skin condition is usually seen on the scalp, eyes, eyebrows, armpits and even where your toddler’s neck creases. It is medically termed as infantile seborrheic dermatitis. In this condition, the skin becomes dry and scaly, and you will notice yellowish crusty patches. Since cradle cap commonly occurs when the child is three to four months old, you may even notice minor hair loss. You should know that cradle cap is not contagious. So you can treat it at home by gently massaging your baby’s scalp with your fingers, or by combing the flaky skin out. Shampoo his head at least once a day. You can even use shampoos that are especially made to tackle cradle cap. In this skin condition, you will notice inflamed red skin around the diaper area. You might even notice a flat or raised rash – or even blisters – around the folds of the toddler’s thighs and legs. A diaper rash is quite common in babies, especially those under the age of one. Fortunately, it is not contagious but may need attention for quick treatment. Your baby might be prescribed a diaper rash cream or an ointment. Most importantly you must keep the baby’s diaper area dry and clean at all times. You can even consider letting him sleep without his bottoms just so the area can get some fresh air. In this skin condition you will notice red rashes on your baby’s forehead, scalp, or cheeks. These can be itchy and painful for the baby. It is commonly seen in children under the age of six months. Eczema can persist even after your baby turns a year old. The bad news is that it can spread to the knees, elbows, and skin creases. But the good news is that it can still clear up on its own. Although there is no definitive cure for eczema, you can manage your baby’s symptoms by bathing with a gentle soap for only five to 10 minutes. Follow it up by applying a thick cream or ointment twice a day. Also, make sure to avoid exacerbating eczema and always use unscented laundry detergent when washing your baby’s clothes. This skin condition can appear anywhere on the baby’s body. It is characterised by small white and yellow bumps that are surrounded by red skin. This is quite common in newborns and you might notice it three to five days after birth. An erythema toxicum usually only lingers for about two weeks, with a maximum of three weeks. Then it goes away on its own. But you can go for a check up if you notice that all these symptoms continue. Fortunately, eruthema toxicum is also non-contagious and your toddler will not need any specific treatment. Also called slapped cheeks disease or erythema infectiosum, this skin condition is common in preschoolers and older toddlers. You might notice it on the cheeks, torso as well as the feet of the toddler. With this skin condition the toddler has bright red cheeks and lacy skin. Sometimes the child may even have a fever, runny nose and cold symptoms. Discovered after scarlet fever, measles, rubella, chicken pox, and roseola; the fifth disease is contagious. Your child might be given acetaminophen or ibuprofen to treat the virus. Although you cannot treat it at home, you can bring down the possibility of his contracting it again by maintaining hygiene. In this condition, some blister-like sores appear on the mouth, palms, soles and even the buttocks. 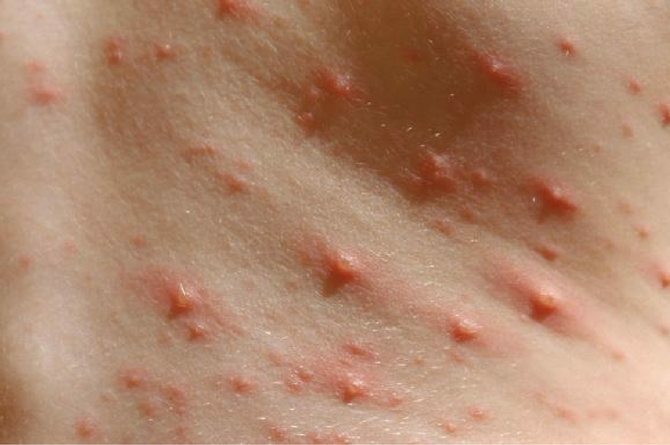 The rashes begin as small red dots and soon develop into bumps and blisters. Although it is common in preschoolers, it can happen to kids at any age. But be careful because this condition is contagious and is commonly caused by the coxsackie virus. Usually kids recover from it within 10 days. But in rare cases, it might lead to meningitis. Fever, constant drooling, and open blisters are some of the common symptoms. If you notice them rush to a doctor. Also, you should avoid giving spicy or salty food to your child if he is suffering from this condition. Maintain hygiene and wash his hands regularly. In this skin condition you will notice small itchy red bumps. These are mostly seen around the mouth and nose and might even spread to other parts of the body. As the condition progresses, the bumps become blisters and develop a brown crust. Your child might suffer from fever, swollen lymph glands and have cold symptoms in this condition. Impetigo is also quite common in children aged between two and six. Sadly, this condition is highly contagious and caused by bacteria that enter the skin through a cut. If this condition is not immediately treated by medication, it can become prolonged. In this skin condition, you will spot acne-like white bumps on your newborn’s cheeks, nose, and even chin. Here, the skin bumps caused by dead skin clog the skin surface. Just like acne, milia doesn’t need treatment and usually resolves on its own. However to treat milia at home you can use a gentle soap while washing your baby’s face. Also avoid hard scrubbing or using lotions. Fortunately, milia is neither contagious nor painful. But if it doesn’t go away in a few weeks you should consider going to a doctor. This skin condition usually appears on the body, face as well as hands. They are basically raised red bumps and can be quite itchy. You may notice that many of them come and go after a few days. But if they persist for more than two weeks you should consult with a doctor. These are usually not contagious but might need medical intervention based on the child’s age and the level of infection. These toddler rashes occur when blocked pores lock sweat into the skin. 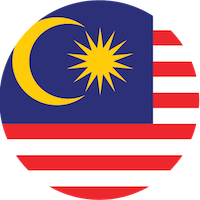 It is mostly because of hot or humid weather. In this condition you will notice red fluid-filled blisters that sprout on the chest, armpits, shoulders, neck, and/or groin. If it doesn’t go away within a few days or looks infected, rush your child to a doctor immediately. Heat rash can be easily managed at home. Choose loose cotton clothing for your baby during hot months. Also make sure you regularly change your toddler’s diapers and keep his diaper area clean and dry at all times. Use a gentle powder to keep most of his body dry and fresh. These toddler rashes are common in kids that are two years and older. These can appear anywhere on the body or their scalp. You will notice that a ringworm looks like a red circle that ranges from the size of a dime to a quarter. Of course, the size increases when you don’t treat the rash. 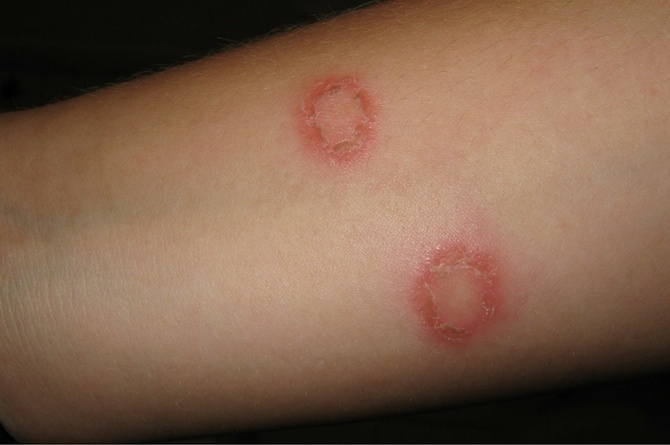 Ringworm is usually dry and crusty on the periphery and smooth and soft in the centre. On the scalp you will notice it as dandruff and even bald spots. Unfortunately, ringworm is contagious and thrives in a humid climate. Keep your toddler clean and dry, and make sure to wash his hands as often as possible. Unlike most other toddler rashes, this one causes a lot of itching. You will notice red bumps between your toddler’s fingers, wrists and elbows, as well as in the armpit and diaper area. They might also show up on kneecaps, soles of the feet, palms, the scalp and even the face. Scabies often leaves curvy red lines in the skin around the rashes and is highly contagious. Your toddler may experience a lot of itching at night, especially after a hot bath. This can occur at any age and if it is his first time, it might fully develop after three to four weeks. This condition intensifies as scabies mites lay eggs in the skin. So the best solution is to keep your child and your home clean. Consult a doctor if it continues for more than a week. Remember that for most of these toddler rashes, the best prevention is good hygiene. When you keep your toddler away from places that can potentially house viruses and bacteria, he becomes less vulnerable. So maintain hygiene. But also make sure to keep track of your child’s body. What may seem like a small rash, might actually turn out to be a bigger infection. So make a note of all these aforesaid symptoms so you can treat toddler rashes before they become deadly.